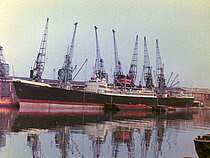 Vassos Haji-Ioannou's ELLI 2, formerly KING ALEXANDER purchased in 1972, is seen at anchor off Lagos on 4th January 1976 with a cargo of Greek manufactured cement. I understand that in spite of having only a limited amount of transhipment facilities in Nigeria they kept on buying cement in huge quantities far beyond their capabilities . Gentlemen, thanks for your interest in this photograph and for your comments. There were an estimated 300 ships at anchor off Lagos on 4th January 1976 when I was very fortunate to be able to hire a boat for eight hours, photographing around 100 of them. ELLI 2 had anchored off Lagos on 12th August 1975 and eventually berthed at Lagos on 3rd April 1976 to discharge her cargo. She was accompanied there, for much the same length of time, by sisterships TOULLA (KING ARTHUR) and KANARIS (KING MALCOLM). At some point in the cement fiasco, the Nigerian Government stepped in to block demurrage payments. 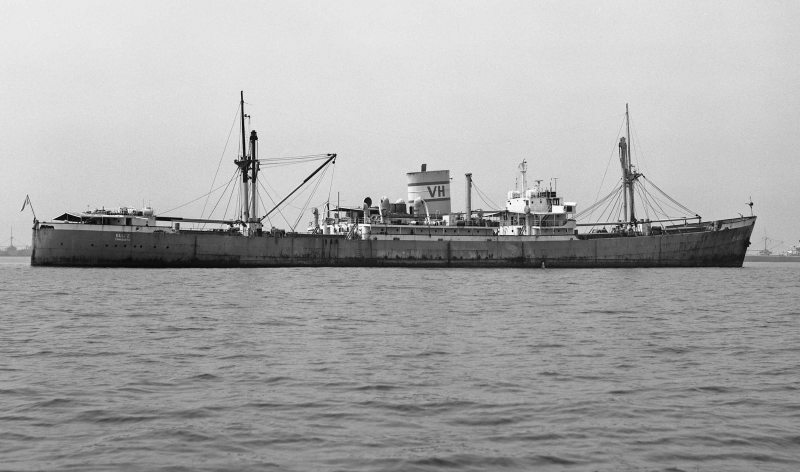 According to shipping industry sources at the time (mid-70's) there were approx. 372 vessels (including 227 carrying cement) moored off Lagos. Unscheduled new arrivals were faced with a wait in excess of 400 days. It was the time of the big cement invasion in Nigeria.